Is that a Fact is an interactive, light-hearted game show that takes four well-known personalities and tests their “Gift for Fiction”. In each episode, guests come up with the most outlandish claims and attempt to fool fellow contestants, convincing them it’s either fact or fiction. Shine Interactive worked closely with Big Brave and Lucky Bean Media to bring the vision of this exciting game show alive. The game features some pretty neat technology. Graphics are generated on the fly and rendered to a number of screens in the studio, real-time. The entire game is operated from a purpose-built console to create, update and play the game in-studio. 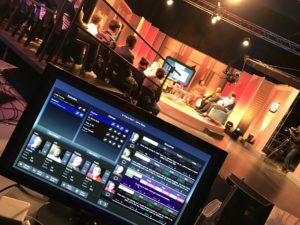 Furthermore, during some studio games, the audience can vote via their smart devices, effectively making them part of the show and giving them direct control over the outcome of the game! For more information about the game and to view episodes, visit the “Is That A Fact” YouTube channel.